The gentlemen of Los Angeles’s Outside Animals appear like a new band fresh off the streaming upload queue and in the public’s social media feed. Some bright artwork, unreleased songs, and a lot of “coming soons” in the spaces where most sites would be loaded with information or interactive media. Here’s the interesting thing about this indie rock group though: Outside Animals isn’t new. It is just able to make listeners feel like they are – and what music listener doesn’t enjoy the mystique of the new and unknown? Colin Orthmann (vocals, guitar) and Mark Peters (bass) have been driving the forces of Outside Animals since 2010, with Gabriel Grinata (drums) more recently taking up the kit. While six total years might make this band sound well-worn in and anything but novel, the LA trio’s newest release, an eponymous EP due for independent release on 10 June 2016, is a solid presentation to the contrary. 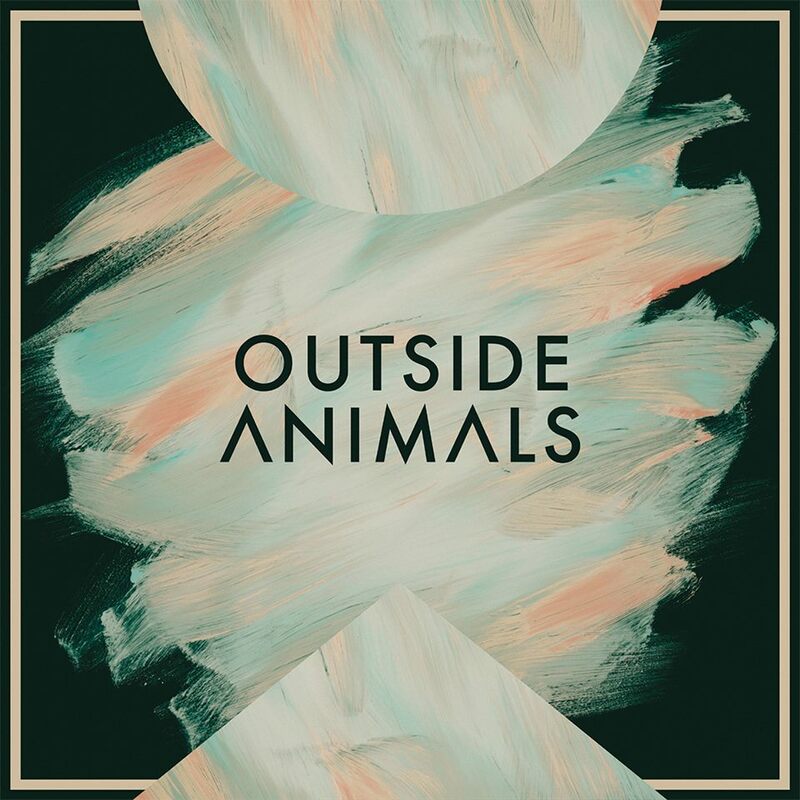 Running a four track effort with this self-titled EP, Outside Animals have managed to combine their well-developed familiarity with one another’s musicianships and a divergence away from the current rise in more jangly, indie pop and stomp-propelled indie folk / folk rock. What’s left is an air that exudes comfort in their own skin as a band (which only comes with time) and the clever turning of an older style of sound – akin to a more classic rock – into something new because it’s what’s swimming against the presently synth saturated, lustrous pop tide. Consistent tones from guitar and bass provide the whole EP with a sonically thematic backbone through each of the four tracks but, every song possesses a thread of its own singularity. Varying aspects of the band’s core lineage of inspiration weave in and out of the tracks. Catchy rhythms with a jittery touch, courtesy of spritely rim hits and a more defined, mix-prominent bass tone, both in the lead single, “Jenny Trouble,” are reminiscent of classic tracks like The Strokes’ “Reptilia” and fall in with propensities of the band’s beloved repertoire. This hurried feel of the music blends with the smoother and slicker character reflected in the bass and the longer notes in the guitar parts, making the songs almost scenic unto themselves. It’s especially hard, when combined with often action-oriented lyrics, not to have a vivid scene form in the mind’s eye, leading the way to thoughts of a future music video. A tendency for minor melodies and a blend of mystique with clear narratives (“Seven paces as your heart starts racing, the smoky eyes leave a path of faces / Any game you’d like to choose / Jenny never played to lose”) could slide right in with the sleek, mildly dark appeal of the Arctic Monkeys. Memorable, easily rhymed choruses (You better run, make it on your own, make up your mind / You’re a fraction of a whole, losing their control / Make up your mind) and easily defined song sections bring together the approachable nature of a Weezer hit and the reliability of classic rock songwriting conventions. Speaking of Weezer, it’s not just the effortlessly likeable quality of Outside Animals’ new songs that resonates with their LA cohorts. A personal run-in and subsequent lengthy conversation with Weezer frontman and composer, Rivers Cuomo, reinvigorated Orthmann when Outside Animals was in a state of frustrated limbo following the departure of half their original lineup. Consequently, Weezer’s impact on Orthmann’s mentality while composing is understandably expected – though a chance meeting like that is likely to inspire Orthmann in ways that shape his current and future songwriting through more than perhaps leaning toward a particular pattern of chords or song structure. Nevertheless, if such an experience helped result in things like the instrumental bridge of “Six Weeks,” the unlikely jolt of first degree encouragement definitely doesn’t hurt. The octave, unison lines by the guitar and bass adds a very effective degree of body to the sound without getting frenetic and the shift to a lead guitar focused solo in the same section makes it feel almost like two bridges; a nice change of pace and a very Rivers Cuomo-esque move. There is some evidence of residual “rough around the edges” character to Outside Animals, maybe as an effect of adjusting to their first release as a new formation, which is nothing to be ashamed of given the very applaudable majority of everything else going on in this EP and even in their 2013 debut EP, Black Room. Though clear, articulate, and memorable, Othrmann’s execution of some lyrics in songs does seem to shy back at points – often at the ends of syllables – momentarily hovering somewhere between singing and speaking. One might say, this approach is common for one like The Strokes’ Julian Casablancas so, what’s the fuss? However, Orthmann is unquestionably a melodic singer and, when these sing-speak moments happen, the drop off in sung tone in favor of spoken delivery doesn’t carry enough committed weight to imply it’s solidly intended. These are instances that are fleeting though and in the scheme of an enthused listening session or blasting the music at a summer party, such details are no derailment from a positive and well enjoyed experience. Colin Orthmann having one of those signature voices – not one that’s likely to be confused with anyone else – makes Outside Animals’ identifiable list of influences appear much less like an opt for the initial identity-less foundation of many developing bands. Rather, the band is a genuine mix of choices and preferences that pay homage to other bands but never in an effort to solely collage those bands’ qualities onto a differently named group. Outside Animals know who they like and what sound they want but their band and their songs are nothing like a Frankenstein’s monster of crudely assembled parts. Outside Animals is due for independent release on 10 June 2016. The EP was recorded and mixed by Todd Bergman and produced by Andrew Furze of Block of Joy. Pre-order is available now through Bandcamp. Get a free download of “Jenny Trouble” from the above SoundCloud player.